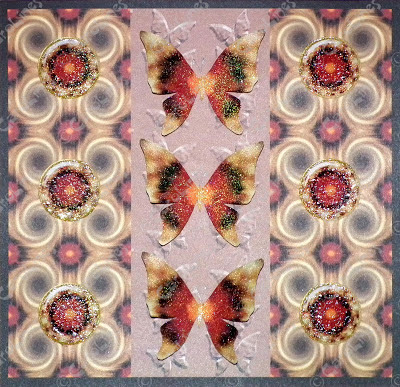 Card 8 using the new Rainbow Butterflies Digikit. This card uses Rainbow Butterflies set 4. 1: Create a dark brown square in your graphics programme approx. 14 cm x 14 cm. 2: Import the embossed background, re-size and position it over the brown paper leaving a small border. 3: Import the patterned paper and crop it to approx. 4.5 cm, keeping the pattern constant. 4: Position this border on the left side of the embossed paper, copy it and paste on the other side. 5: Import the button, re-size, copy and paste, and position 3 along the patterned border as illustrated. 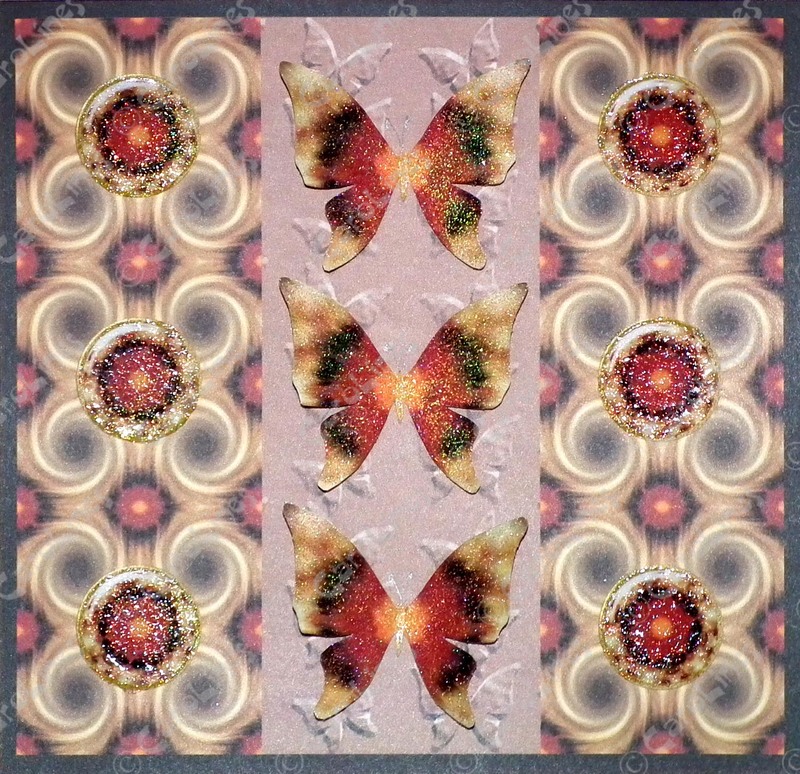 7: 'Deconstruct' the card so you have the 3 butterflies and the card design (including the butterflies). Print all on to good quality card. Cut the butterflies out, removing the antennae. 8: Use a Versamark pen and a clear glitter powder to emboss the buttons. 9: Use a Versamark pad and the same powder to emboss all 3 butterflies. 10: Glue the bodies over those on the card. 11: Add peel-off, gems and glitter if wished.